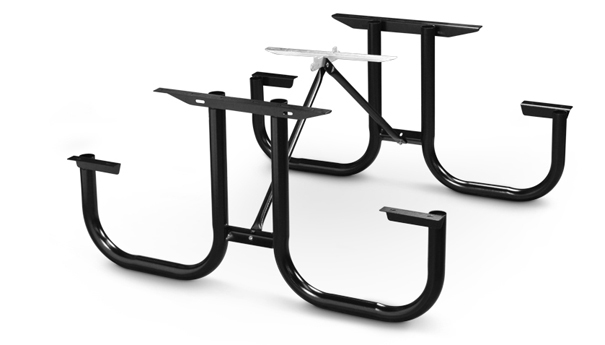 The Park Master picnic table frames are the best in the parks and recreation industry. Constructed with heavy-duty, commercial grade 2-3/8" O.D. steel tubing available in powder-coated black or hot dip galvanized. Frame finish: Hot-Dipped Galvanized or Black Enamel. Top angles: 1/10" thick (12 ga.) galvanized steel plate. Seat brackets: 1/10" thick (12 ga.) galvanized steel plate. Recommended for use with wood planks only, use with recycled plastic planks requires additional supports and bracing - not included nor currently available. Frame accommodates 6' - 8' planks and can be configured for single or double overhang universal access tables. The frame design offers easy slide in seating for all age groups. Fully welded for extra rigidity and maximum vandal resistance. ►Need a Park Master Picnic Table Frame Kit Fast?